Jesus freak Hideout (John DiBiase): For the third FM Static album, Dear Diary, what was your inspiration for the diary theme? Trevor McNevan: We were on a tour as Thousand Foot Krutch with Skillet, and honestly it wasn't one thing. The last couple years, I've been into trying to create music a little more theatrically, and I'm a big movie fan. I think it was a little bit stemmed through that, but nothing specific. It was kind of just a really inspired record, man. It wasn't even like, "Here's when we've gotta start writing this, and here's when we've gotta record it." It just kind of came about. It was refreshing, man, and I had a blast. I love just writing in general, so I got to write a story based around the subject and kind of let the songs tell the rest of the story. It was a lot of fun. My buddy Nathan Parish, who plays for Worth Dying For, did all the illustrations throughout the record. We were also blessed to get this amazing animator from Germany. He does a lot of incredible stuff, including three videos for the FM Static videos for the record. All the videos are animated, we're not even in them. It's kind of fun, actually. It's gonna further tell the story of the boy [from the diary]. It's a whole different way to approach a record. It was as inspired as when I sit down to just right anything. It wasn't contrived. With the way you write stories, there's a little more thought that has to go into the overall big picture. It was just a very natural progression. I'm very excited about it! JFH (John): So when you started writing it, did you know that you wanted to do a concept record, or did the songs just kind of come out as you started writing? Trevor: That was the thought before I even started writing. I think that's what inspired the whole idea, just being excited about it made everything else just flow out. JFH (John): How'd you come up with the character Aero? Trevor: Well actually, we didn't name him until right before the record came out. We wanted to do a blog online where he introduced the story a little bit at a time. It seemed a little unidentifiable to have him be nameless, so we just called him Aero Static. Tricia Brock from Superchick, who is actually married to our guitar player, is a really good friend of mine, and she's kind of the female voice in the story. The boy calls her "E.T." because he's just blown away by this girl. It was so fun, man. I'm excited to just share the music with people. We've gotten a really encouraging response from it, which has been awesome. It was kind of freaky because I've never done the story concept thing in the past. So you don't know if people are just gonna bypass one half of it and just listen to the music. It really is kind of a "read and listen" experience. It's good, we were blessed. JFH (John): So do you write the Aero blogs then? 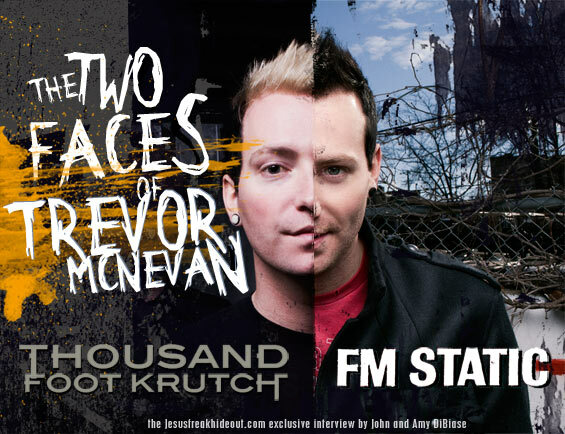 Trevor: I'll be totally honest, I kind of proof the blogs, because there was so much writing, and I had went straight from writing for FM Static to recording the new Thousand Foot Krutch record. So it was more of me just proofing on that, but it was inspired by the story. JFH (John): Did you keep a diary as a teenager? Trevor: I did. Well, it wasn't very cool to keep a diary, so I had a journal. A school journal… which is still a diary… it's like calling something a "man bag." *laughs* But yeah, I did keep one though, mostly through grades 1 to 6 or so. I was always into music, but before I started writing songs, I was just into writing little stories and stuff like that. It was one of those things that was kind of fun for different reasons. JFH (John): How much of the high school story [from Dear Diary] is you? Trevor: Some of it! I love that stuff, just the whole high school thing. I loved it then, I love it now. There are a lot of little parts in the story that are kind of just honesty of talking about things that I remember thinking. Things like big life questions, and also things that seem so big when you're in high school and then you look back at them now and think, "That's hilarious, it totally didn't matter." So yeah, it kind of takes a journey through a lot of that, and then some of it is fictional. But that was kind of part of the fun of that. We get a lot of emails and letters from fans and some of that can be inspired from some of that as well, like stuff that I haven't personally been through. Ultimately, I hope that people can enjoy it and understand the meshing together of the two and hopefully relate to it in some way, you know? JFH (John): So if you like the whole old teenage politics thing, do you have any favorite high school movies? Trevor: Yeah, I'm trying to think - there's so many great movies from back then. JFH (Amy DiBiase): Ferris Bueller's Day Off? Trevor: Oh! One of the best, absolutely. I still love that movie. Man, Weird Science… there's so many great movies from back then. But yeah, I think Ferris Bueller's Day Off is my favorite. You called it! JFH (Amy): In the movie 17 Again, there was a line that the lead character said that was almost word-for-word what you just said. It was something like, "Things happen in your high school years where it seems like it's the end of the world, but it's really very small when you look at the grand scheme of things." Trevor: For sure! When someone tries to explain that to you though when you're in high school, you're like, "Dude, you just don't understand. Whatever. You couldn't picture this." And then on top of that, there's so much politics involved with high school. That's another thing I just love, especially in movies like Mean Girls. You step into this whole new world that you weren't ready for, no matter who you are. It's kind of cool. In the Dear Diary story, the boy moves to a new town because his parents have to relocate and their marriage is kind of on the rocks. So he's kind of going through that whole thing too, of "Who am I gonna be in this city? Am I gonna be the same guy? Nobody knows me, so I can be whoever I want." JFH (Amy): That's excellent for a song. Trevor: I can relate to a lot of that stuff for sure. But I've been getting a lot of flack from DJ's about the titles of the songs because they're so long. *laughs* I knew that would happen and it kind of makes me laugh. But originally, we weren't sure if we were gonna be able to have the story in the book. So the long song titles were a way to tell more about the songs' stories. JFH (John): What was your high school experience like? Trevor: It was good, man. I didn't have a jaded high school experience *laughs*, but I was definitely more into socializing than academics, which isn't cool when I look back. I thought it was at the time. *laughs* But yeah, it was good. I love people in general. The funny thing is that it wasn't like, "Here's the musicians." With my brothers, I'm in an athletic, sports-driven family. They've all played professional sports at some time. I was kind of the only musician… period. My family can't even clap on beat. So I was just used to that world. It was this weird mesh of hanging out with jocks and musicians and people in between. I was kind of thankful for that actually. I'm in some ways a little more rounded than some of my musician friends who would feel uncomfortable "over here" compared to "over there." It was kind of interesting. I moved around a little too. I went to a Christian school for a little bit. I went to public school for a long time, and then I actually just finished pursuing music from home school. JFH (John): Did you like home school or did you miss the whole high school experience? Trevor: By that point, man, I was just so focused on music that I was like, "I just want to finish this chapter of the book and move on." JFH (John): When did you start Thousand Foot Krutch in relation to that point in your life? Trevor: I was 17 when I started TFK. It was all different members from my original hometown. I'm from Peterborough, Ontario, just north of Toronto. There have been a lot of member changes through the years. The guys we have now we kind of met their musical circles along the way. We've been together for a long time now. It's been awesome, looking back. You don't stop and think about it a whole lot. We're so blessed to just still be here making music. It's been a long time - 13 years or whatever. It's pretty fun, man. It's a privilege. JFH (John): What made you choose Tricia Brock to represent the female voice in the story from Dear Diary? JFH (John): Yeah! I still have the first 7 Ball issue. Hoi Polloi was on the cover. Trevor: Yeah! So yeah, we were pumped. We were this little Ontario band just trying to play around as much as we could. So us and Superchick were on the same "Somebody Sign These Guys" disc, so we kind of met then and played a bunch of shows together through the years. Tricia and Melissa Brock had told me that they liked the first FM Static record. So on the second one, we tried to make it happen and hook up. Then she [Tricia] married Nick, our guitar player, and then my wife and her and everybody became better friends so it just kind of worked out. She's awesome, man, so it was fun. JFH (John): So is there an actual name for the female character or is it just E.T.? Trevor: It's just "E.T." We didn't really go beyond that. You know what's funny is that when I think of E.T., it's like "Everyone knows E.T.," but we've actually had a lot of emails of people being like "What's 'E.T.?' What is that?" I was like "Am I that old? Really?" It's crazy! JFH (Amy): They need to go to Universal Studios and take the ride. Trevor: For sure! It's a great movie, everyone needs to check it out. JFH (Amy): Is the song "Her Father's Song" about E.T. 's dad? Trevor: Yep, E.T. 's dad. I was wondering at first if that was a little too serious going into the story part of it, but I felt like it gave the record a little more depth. It wasn't just like a fun, shiny, happy record. It's more real to me, anyways. There's a tragedy involved. She's kind of his only friend that shares that faith. She's trying to explain to him that there's more to life. He sees something in her that he's never seen in someone and is wondering what it is. It ends up being a relationship with God. It just causes him to think about that. And that was me. I remember thinking about that through exposure from different people and being like, "Huh, I wonder if there is more to this. I wonder if God is real and if He actually loves me or does it just sound good?" So yeah, it's one of those stories. It covers a lot of ground. JFH (John): Was the tragedy inspired by any specific thing, or was it just natural to the story? Trevor: It was more of just an inspired idea for the story. With TFK, we get tons of emails and stuff. And even talking to people at shows, we get a lot of aggressive stories about suicide and people just feeling like there's nothing left. We feel privileged that people are willing to talk to us as a friend about it. So we actually partnered with a suicide hotline just to pass someone along to, because obviously it's not our professional hat that we wear. We talk to the fans as friends, and with the tragedy, it was just something that was more on my heart with both bands - to touch on that more. It's happened in my life within my circle of friends and family a little bit. There's a lot of broken people and broken hearts because of that, so I felt like it was something that should be talked about in the story. It felt real. The new TFK record, called Welcome to the Masquerade, has the whole idea inspired from the different masks that we all wear at different points in our lives. It has a lot of songs for the broken hearted and songs of hope. That's kind of the underlying theme. There are a lot of people in our lives that have things going on behind that we'll just never know - whether it's a secret life or just secrets in general. That was something that was really heavy on my heart for that record. We have the privilege to hang with a lot of people that share that stuff. We all have a lot of baggage. There's a lot of stuff that you don't want people to know that you think or talk about. As Christians in general, it's like taboo or something. People don't want to get it out and be like, "Well, this is what I'm dealing with! Can we talk about it?" It just never happens. Well, it does, but just not that often. That's where I think our heart is at with both bands. The musical styles are very different, but it's kind of just like trying to bring some of the experiences of our journey through talking to God and finding out that He is real and has a plan for our life. It's maybe not as traditional as some, but it was more of what made sense to us. JFH (John): What inspired the song "Take Me as I Am?" Trevor: This is a funny story. Part of this song was written before this record was even thought of. My little brother - he's amazing, he's a hockey player. He plays pro hockey in Germany, actually. He's always listened to demos through my iPod. We've had thousands of demos over the years, so he's always listening to them. He was working out one day because he trains for a living. He called me up out of nowhere and was like, "Man, what's up with this one idea? How come you haven't used this? I love this song!" It was something we were working on for the second FM Static record and it just got lost in the mix. So I listened to it again. It was just funny, because there was only a quarter of the song there, but it just tied into the story and that moment. I was at that point in the story where I felt like something needed to change. It kind of became that moment. I felt like it was a good point in the story for Aero to be like, "This is me, though I'm not perfect. This is who I am." So it kind of just worked out really well. The rest of that song was finished kind of just by taking that "take me as I am" theme into the story. So thank-you to my brother. JFH (John): Have you thought about a fourth record, maybe with a college theme? Trevor: I've definitely thought about it. I've been thinking about it a lot. Maybe, that's all I can say. I can't promise, but it would be a lot of fun. If we could do it, I'd love to. We'll have to see. There definitely will be a fourth record though. That's the plan. JFH (John): Real quick on the new TFK record…you said on the online chat you did recently that you're kind of going with a heavier sound? Trevor: Yeah, I think the new record is definitely more aggressive. In some areas, it's the heaviest we've ever been. I'm really excited about that. In other ways, it's probably maybe the quietest we've ever been. It's a pretty wide spectrum, but it's definitely big, crunchy, adrenaline rock. I love that stuff. There are a lot of anthemic-type songs on it. I'm just pumped about it. I'm really excited, I can't wait. JFH (Amy): Who's producing it? Trevor: I actually produced it with Aaron Sprinkle. We worked on it together. Same with the latest FM Static record. He's an incredibly talented guy and producer. He's produced over 200 records. We were talking about it the other day and it's like "What!? How is that humanly possible?" He's just amazing and we're good friends as well. It's a privilege to work with him on it. JFH (John): Are there any other people you're working with on it? Any guests? Trevor: My buddy Adam Smith, who's from here in Nashville, has played with several other bands. He plays piano for me on a lot of stuff. He played piano on Dear Diary. Randy Torres from Project 86 plays some guitar on it. It's a blast! FM Static's latest album, Dear Diary, is in stores now!